FO: Walk Away | Stitch, Brinn, Stitch! I finished the socks I started just the other day, possibly because I used a larger needle than I usually knit socks with. 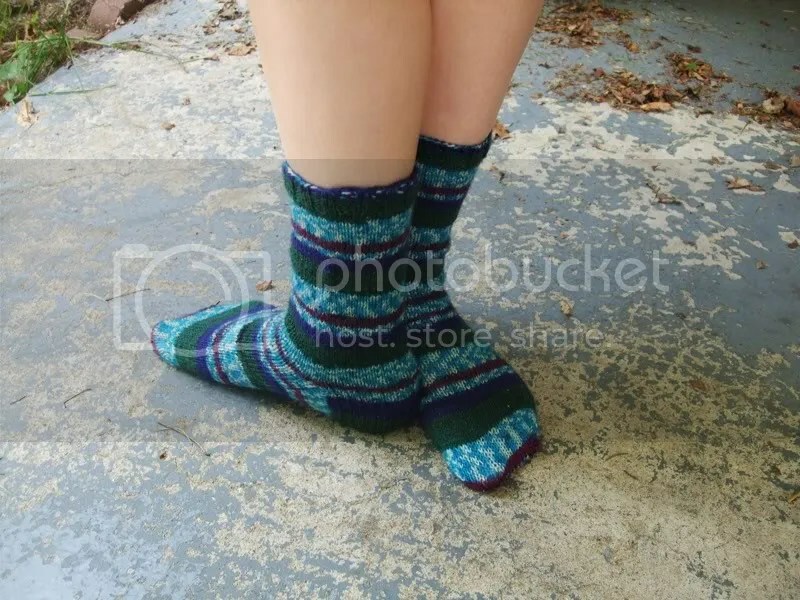 Pattern: It’s a cuff-down sock. Regular toe, flap/gusset heel. So these socks are knit a bit loose than I usually knit socks but the yarn is also very thick for sock yarn–it’s almost like a light sport weight. The socks are pretty comfortable and I suspect that once I toss them in the washing machine and dryer, they’ll tighten up a bit. 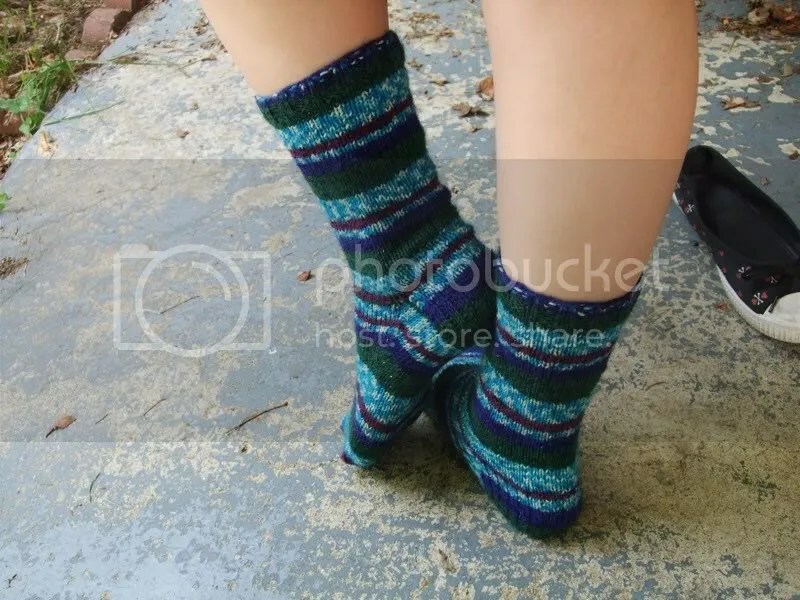 They fit pretty well and the yarn is soft enough. Knitting with the yarn was kind of a PITA though. It’s kind of like corespun–it’s wooly on the outside, but there’s a core thread of elastic/nylon and the two fibers stretch at different rates, so the wooly bit kept getting bunched up on the core thread. That was annoying. Also, the core shows through in a couple of spots. On the whole, I’m pretty happy with the socks though. The color is quite lovely and I even got them to match! (Mostly–one is about a row ahead of the other.) 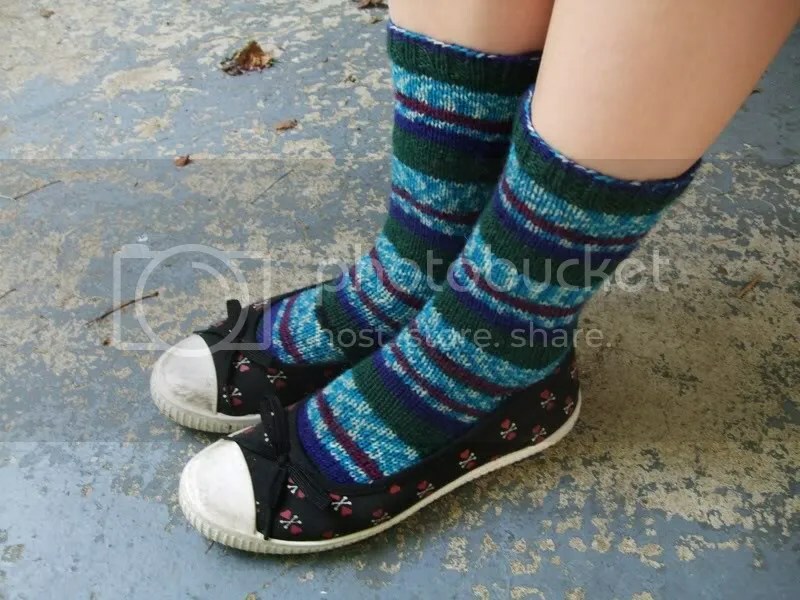 I’m sure they will get lots of wear this winter when it is cool enough to wear mid-calf-high wool socks. Now I have three pairs like that! In case you haven’t noticed, I’m on something of a sock kick lately. Currently I have another pair of footies (for flats) on the needles (from the Ravenclaw yarn). I’m also about halfway through a shrug I’m designing (and hoping to finish with 380 yards–it’s gonna be close). Got some real work done on grown-up things yesterday and tonight I’m off to a pedicure with my boyfriend’s mother and sister (which is lovelier than it might sound–I quite like them). Still have to figure out how I’m getting back to Virginia Beach next week, but right now, I’m just going to relax and try not to kick some poor woman in the face when she inevitably tickles my very ticklish feet. I know the sock kick feeling…I’ve got one pair on needles (well, the first one is done, the second one is about half-way through the leg) and I’m itching to start another pair on our trip. I need something small but powerful to bring with for the car.